Peter Berg’s carved out a fruitful niche for himself recently by taking topical real life tragedies and putting them on screen, usually with a degree of care and compassion for the people involved in the actual events. 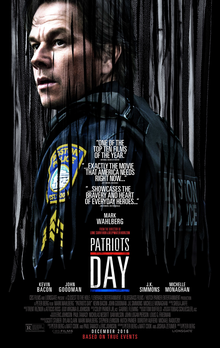 ‘Patriot’s Day’ is another film that does just this, following ‘Lone Survivor’ and ‘Deepwater Horizon’, with this movie focusing on the Boston Marathon bombings of 2013. Stylistically this is more of the same and Berg knows how to craft these events into an effective narrative that manages to both work as a movie, and also pay tribute to those impacted directly without feeling exploitative. The film begins by introducing a variety of characters, from law enforcement to ordinary citizens, to the bombers themselves, and it’s not particularly smooth with these introductions. The dialogue is clunky, and exposition is bombarded at the audience so we can get a feel for what makes these characters tick without adding to an already lengthy running. Berg’s strong suit is the action and the film starts to click into place once the marathon begins and the bombs go off, with the narrowed aim of catching the bombers giving the film a renewed focus. Mark Wahlberg is clearly Peter Berg’s go to man for these kind of films, and his character here acts as a composite of various real life characters (which explains why he seems to be in the right place at the right time throughout), whilst Berg’s packed his supporting cast with stellar performers, most of whom are given limited time to shine but help to add extra gravitas to key sequences. My knowledge of the bombings extended little beyond the incident itself and the fact that the two bombers were not caught for several days, so I was fully immersed in ‘Patriot’s Day’ as the story started to unfold, and I gradually found myself drawn into the stories of the people who found themselves caught up in the action. Technically the film is superbly crafted, highlighted by a terrific shootout sequence on an ordinary Boston street that had me on the edge of my seat, and Berg also adds some cleverly dropped in splashes of humour that add necessary moments of levity. ‘Patriot’s Day’ is another well directed fact based thriller from Peter Berg and I thought it was really entertaining.